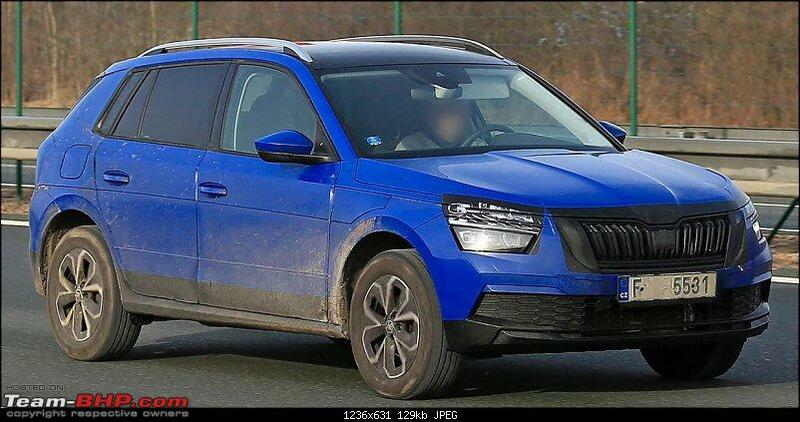 The India-bound Skoda Kamiq compact SUV will be based on Volkswagen’s MQB-A0-IN platform and is going to be slightly different to the Euro-spec model. Under the India 2.0 strategy, Volkswagen Group is soon going to introduce multiple new product in our country. All their future operation will be led by their brand Skoda. Under this new scheme, the first product to be launched by the German automaker under its Czech brand is going to be a compact SUV by the name of the Kamiq. It will be quite different from the Chinese spec iteration and is effectively going to be the group’s smallest utility vehicle by far. The interiors of the Skoda Kamiq SUV seems quite plush. The upholstery is obviously leather wrapped and the colour scheme is primarily black. It comes with a large touchscreen infotainment system in the centre. The instrument cluster is fully digital. The Skoda Kamiq will reach Indian shores after the same has made its debut in the European countries. The India-spec version of this compact SUV is going to be based on the Volkswagen Group’s MQB-A0-IN platform. This platform will be highly localized and help the automaker to keep the prices competitive. Talking about the prices, we expect the same to fall in-between the range of INR 9 lakh to INR 15 lakh. With this, it becomes quite obvious that the Kamiq is going to compete with the likes of Hyundai Creta and the Nissan Kicks.